For an entry-level hatch-back, the Holden Astra R is a welcomed refresh compared to it’s predecessors. It handles twists and turns and provides more than you would expect for a zippy city car with a sophisticated suspension and impressive noise suppression. It is lighter, yet roomier, than previous models and is generally a pleasure to drive. The Astra R has a 5-Star ANCAP rating, Electronic stability control, traction control, and ABS, and there are six airbags. The optional driver assist pack includes a leather steering wheel, AEB, rain sensing wipers and more, at additional cost (see below). Electronics/Media: The Holden MyLink operates on a 7-inch touchscreen with DAB+, bluetooth, Android Auto and Apple CarPlay. boot space: 360 Litres and up to 1210L with folded rear seats. Comparable models: Mazda3, Volkswagen Golf 92TSI, Peugeot 308, Ford Focus Trend, Toyota Corolla Ascent Sport (all within $22-$24,000 entry). Engine: 1.4 litre turbo four-cylinder petrol engine that makes 110 kw in power and 240 NM in torque. The engine is competitive amongst rival models on the market, although it doesn’t have much grunt for speedy acceleration and Holden doesn’t list a 0-100km time. You have the option for a 6-speed automatic transmission, or a manual. The combined fuel economy rating is 5.8L/100km (though some test drives reported closer to 8.2L/100km), which is generally better than other comparable cars, or only slightly less. At 135g/km of CO2, the emissions ratings are also quite impressive. The manual and automatic models have the same ratings. There is a basic warranty of 3 years or 100,000km warranty. 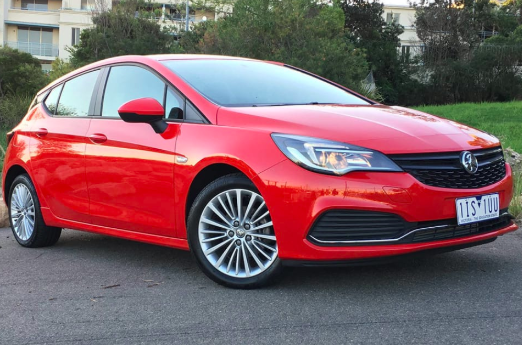 Entry for a new 2017 Astra R starts at $21,990 for manual transmission and an extra $2,200 for the automatic. There is also an option for a $1000 Driver assist pack which will give you AEB, lane-changing assist, forward distance indicator with collision warning, and a heated steering wheel. Other than Red and White, body colours also cost an additional $550. At this stage, used models run from $11,000 to $15,000 as a starting asking price for private sales. Asking price greatly depends on the number of owners, documented service history, kilometres driven, and overall wear and tear. At this stage, the Astra R hasn’t really been around long enough for there to be any major issues consistently reported. There haven’t been any recalls and most owners seem generally happy with their car if they’re just using it to zip around town. It is lacking a bit in safety features and it’s fuel economy hasn’t reportedly stood up to the manufacturer claims, but otherwise it’s a pretty solid choice. Pros: Nice exterior design and a fun, sporty feel while driving. Roomier than the previous model with a lighter body for better handling. Cons: Lacking in features and flare considering the price point, higher entry than the Cruze. It’s also somewhat slow on acceleration. If you’re looking at selling a car or you require cash for cars make an enquiry with us today.